Thanks. I encourage you to check it out. The test is inexpensive, can be done on your own at home, and reportedly accurate to reflect stores of iodine in the body. I think it may be useful to many people who have thyroid issues but are unsure whether iodine sufficiency is part of their problem or perhaps something they can rule out. Guessing about what to take and how much to take based solely on concurrent physical reactions is very subjective and can be influenced my so many different variables aside from the one or two supplements one is keeping an eye on. Hope this makes sense! Thanks again. The link you posted does not work. I could browse around on zrtlabs but prefer to get the exact link that you intended. i think you have to order it as part of a panel now, see this link…. Thanks Jay. Got it. I find it interesting that zrtlabs promotes the use of thyroid hormone status as a marker for Iodine sufficiency. On the one hand it’s kind of cool… but on the other hand it’s ignoring the sufficiency of the rest of the body. 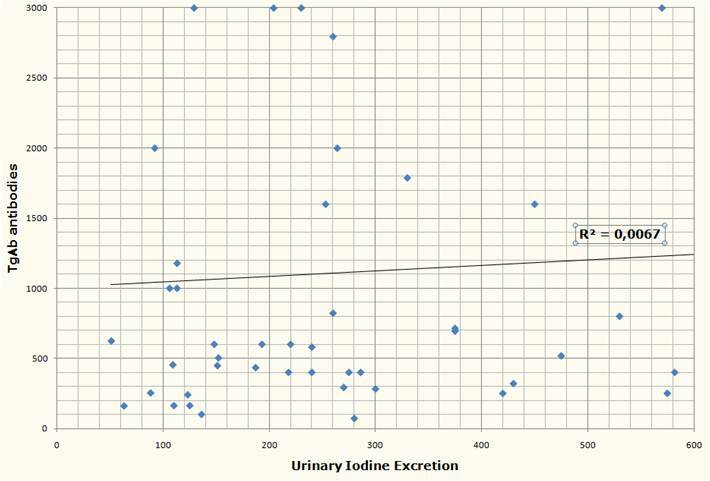 I guess since they are focused on thyroid that the reference ranges for their urinary Iodine test may be low or in-applicable for someone seeking optimal. Since this was Posted in May of 2011 — I am wondering how Paul’s Thyroid is now (2013) and if he would change anything he took/ate/supplements if making suggestions for himself or others today. My Thyroid health has been going downhill since 2006 and since having Breast Cancer, has continued to worsen. I would be grateful for any input or suggestions. Thanks in advance. The main difference is that after learning toward higher doses of selenium and iodine for a few years, I’ve shifted back to taking less than 1 mg/day iodine and selenium only once a week. Also I supplement low-dose lithium now which affects the thyroid. Paul, how do I fix the mistake of taking too much iodine? I started in Jan’13 with iodine of 1mg/day and zero selenium supplementation. At he same time, I began Bulletproof’s Rapid fat loss protocol. The end result is not too wonderful as my February blood test results show: my total cholesterol doubled to 440 and my TSH hormones doubled to 2.84. Seems like the case of reactive hypothyroidism. So how should I adjust my iodine and selenium intake considering my history? (By the way, I eat liver weekly and grass-fed beef almost every day.) Your advice is much appreciated! I would immediately reduce the iodine to less than 1 mg/day, 225 mcg/day is enough, and take selenium supplements 200 mcg/wk. I’d also add some carbs in. I’m not quite sure that the iodine/selenium is behind your problem, it’s probably more likely you have been too low carb. That was a fast reply. Thank you, Paul! In order to better understand this issue, what’s the main reason for your selenium dosage recommendation? Dave Asprey recommends 200mcg per DAY not per week (he also suggests taking 1mg / day of iodine). Thanks. Our diet is very selenium rich (beef, lamb, seafood, eggs) so I’m concerned about selenium overdose. I developed a selenium overdose a year ago on 200 mcg/day and you’ll see in the new edition discussion that selenium content of food is highly variable. 1 mg/day iodine should be OK but since you’ve had a problematic experience might as well be cautious. 225 mcg is enough for optimal thyroid function. I do think that insufficient carbs is more likely than an iodine or selenium overdose. Paul, that makes sense. Thanks again for your thoughtful replies. Love your website and your knowledgeable advice. How did you learn that you were suffering from selenium overdose? Brittle fingernails was the first clue. But I didn’t figure it out until I started to get hypothyroid symptoms. Paul, to clarify, is 225 mcg of iodine optimal for anyone or for people with a sluggish thyroid? I’ve been on this dose since early march and wondering if I should double it. I haven’t re-tested my sluggish thyroid but probably should since I gained 10 lbs since march after starting also eating carbs per your recommendation. Frustrated with the weight gain especially because i am doing IF four days a week. Need to tweak something here. Thank you! I think it’s very good for everyone. It would be OK to double it, but 225 mcg should be just as good at supporting thyroid function which is the key for weight loss. Try removing extra nutrient-poor fat from your foods, eg oils, and see if that stabilizes your weight. Keep egg yolks and such which have nourishment. Previous diagnosis of ADHD and Ritalin prescribed. Female patient diagnosed with Hashimoto’s in September 2010 at the age of 13. 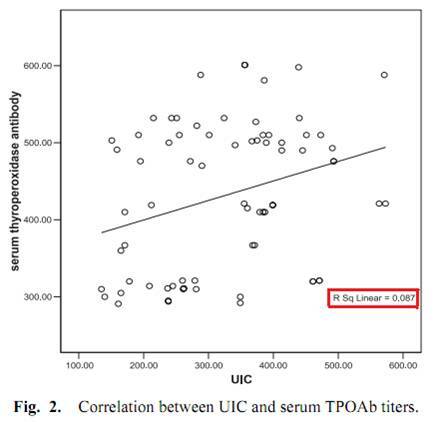 Initial antibody levels were TPO(Ab)= 253, and Tab=838. About September 2010 started Synthroid at 100 mcg/day and remained stable. About October 2010 first Homeopathic intercurrent remedy given at 200C. About November 2010 started on Abilify for Bipolar disorder. January/February 2011 started to complain about sore feet. Nothing could be found causing this but it continued. Selenium was not taken every day. Rather the dose was increased on days taken so it averaged out to the equivalent of 200-300 micrograms per day. Selenium has a long half life in the body which helps this average out nicely. (Note: This is important. However, although other vitamins were not taken daily either, their dose was NOT increased on days taken to average out to a recommended daily amount.) The timing of using the protocol was not by choice, but by logistic limitations. May 2011 started on kelp for small amounts of Iodine. One kelp capsule per day increasing to 4 per day over a period of a couple of weeks. About June 2011 was started on Lamictal for bipolar disorder. Salt and water detox protocol was stared part time based on Celtic Sea Salt. May 2012 a constitutional homeopathic remedy was given at 200C. Friends and family noticed an improvement in her temperament. This appeared to be a proper selection. She also stopped experimenting with smoking Tobacco which is interesting because the remedy selected is a classic one for addictive personalities and addictions. June 2012, Synthroid was reduced to 88 mcg per day. Between May 2012 and November 2012 the constitutional homeopathic remedy was repeated every two weeks to two months at a 200C potency. December 2012 Thorne Meriva-500 and M.F. Bromelain were added to the protocol. Two caps of each on days when the protocol was in use, usually 3 but up to 7 days per week. December 2012 a different Homeopathic constitutional remedy was given at 200C. This is a complementary remedy to the first. January 2013 the second homeopathic constitutional remedy was given at 1M. February 2013 thyroid antibody levels were measured. TPO(Ab)=59 and Tab= 225. I hope to test reducing her Lamictal dose soon but need to get the prescribing doctor to cooperate. I have hashimotos as well as type 1 diabetes. I read Dr. Browstein’s book on iodine and instantly started to take 50 mg of iodine with 100 mcg of selenium. This was in addition to the 1 grain Nature-Throid med I am taking. The first few days I began to see a difference in my blood sugars. They seemed to be a lot lower and I didn’t have to take as much insulin. Then my blood sugars began to increase, often not even responding to insulin correction. I do not have symptoms of hyperthyroidism ie heart palpitations and my BBT is at 97.8F. I don’t know what to do because most doctors that I talk to are unfamiliar with iodine including the nature path I am seeing now who insists the iodine will aggravate my thyroid condition. Do you have any advice? It concludes in part 1 that our selenium levels should be optimal in order to tolerate a wide range of iodine. Any excess or deficiency should cause harm. In part 2, it concludes the same. What level of selenium is optimal? And how do we test it? blood? serum? plasma? urine? hair? nails? What levels are considered toxic (seleniosis)? These are really important questions that I believe should have been clearly answered in the article. I have since corrected my selenium dosage to 225mcg a week and have increased my iodine up to 1.5 mg a day. The higher dose of iodine seems to keep the sick feeling at bay but it comes back when I stop using it. I definitely believe the high dose of selenium caused some sort of problem in my body. What would you recommend to correct this? 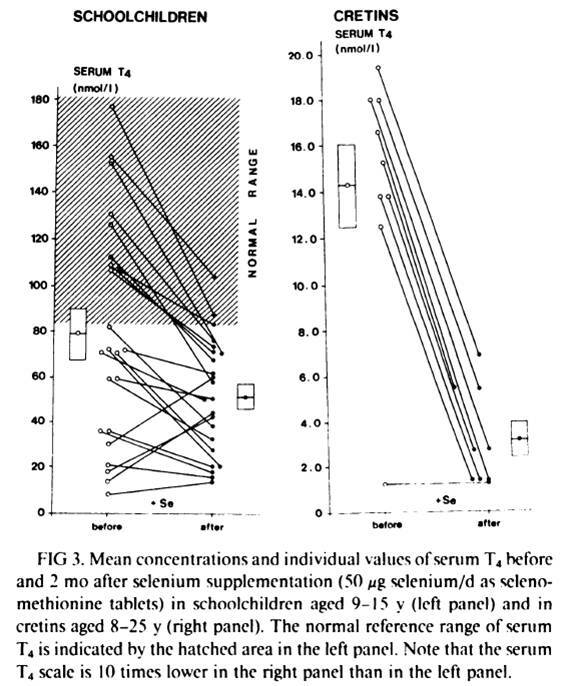 For me, one of the most valuable parts of this article was seeing how selenium supplementation with an iodine deficiency could could lower T4 and create potential thyroid issues. I’ve never see that information before. I also wonder, having supplemented between 200-400mcg of selenium daily for years, while avoiding iodine in supplements and not eating seafood, might play at least a minor role in my mysterious hypothyroid issues which my naturopath and MD can’t seem to get a handle on (I am not taking meds at this time). Will try adding a moderate amount of iodine. I have Hashimoto’s and PCOS. I am trying to get a grip on my supplements as I am having difficulty treating the Hashimoto’s naturally. I was on 25 mg. of Synthroid for a year when first diagnosed but I quickly went hyperthyroid on it because I believe I was eating foods high in iodine and this on top of the synthroid, was pushing me over to hyper. I stopped the synthroid because I didn’t feel it was helping. I began to eat foods high in iodine and this did help me for a while, but it became too difficult to keep that diet up. Now, I am taking some supplements that I believe are helping but I just can’t seem to get it down pat. 1 gram of Vitamin C (I have adrenal fatigue and this seems to be helping. If I am particularly stressed, I will take an additional gram later in the day, for a total of 2 grams a day). I take a children’s chewable multivitamin because I have not found an adult multi that I like that does not have herbs in it. The brand is called Dinosaurs and I take 3 vitamins, as one is the recommended dose for 2-4 yr. olds. I am in my late 30’s. 10,000 iu of Vitamin D3 a day. Doctor found extremely low levels of Vitamin D. The levels went up this summer due to supplements and sun exposure during summer, but now that it is fall/winter, I feel I need this amount. 100 mg. of Selenium a day. I was taking 200 mg. a day but multi has selenium and I could also eat food that has selenium, I found it better to take the 100 mg. to avoid getting too much. Not sure if this is ok or if I should go up. Because of the PCOS, I take extra inositol (500 mg. a day). I try not to eat sugar or carbs but I have trouble cutting both out of my diet completely so this is supposed to help with regulating blood sugar. I go back and forth between thyroid supplements. I took the Gaia Thyroid Support for a while and that seemed to be working out ok, but I am not all that comfortable with the amount of herbs in the product. I have also tried Dr. Michael Murray’s Thyroid Health Formula, and this is ok too, but sometimes I feel it pushes me to hyper. I also took a Kelp supplement and that was ok too. I don’t know which of these three would work best. I don’t think either the Gaia or the Kelp supplements were enough as I still had very low energy while taking them. I used to take L-tyrosine supplement, which I have heard is good to take for thyroid, but that is in the Dr. Murray and Gaia supplement so I don’t take it alone if I am taking the Gaia or Dr. Murray supplements. I also recently decided to add a low dose (50) B-complex vitamin because of the lack of energy but I don’t know if this is going to be too much. I know B vitamins are good for thyroid but I don’t know if this would be too much on top of the multi and foods I eat. Additionally, I take a progesterone supplement due to the PCOS. So, that is it. Do you have any recommendations for me or suggestions? Thank you! In general you should experiment with Synthroid doses. Doctors can’t know what dose is right for you, and so you should cut pills into fractions and try various amounts until you see which makes you feel best. I think it’s good to take a low but regular dose of iodine, say 225 mcg per day in supplements plus some seaweed and seafood in your diet. You can take extra vitamin C, I recommend getting a powder and using it to flavor water. Selenium — if you eat the PHD recommended foods of beef/lamb and seafood you probably don’t need to supplement selenium at all. If you day, try 200 mg once or twice a week. You might take choline with the inositol. I am also skeptical of supplementing herbs. I would recommend the standard PHD supplements and supplemental foods, and diet, and circadian rhythm strategies. Can I take synthroid and iodine supplements at the same time? I have read conflicting reports on this. What is the highest dost of Vitamin C you would recommend for someone with adrenal fatigue? What is the best form of iodine that you recommend for hashimotos? Is 100 mcg of Potassium Iodide good? Hi Paul, thanks for the great articles. I have a question though: Why did you decrease your iodine intake recently? I am sorry Paul I have mistakenly assumed that you wrote the article and were taking 50mg iodine. Does Mario Renato Iwakura still take 50mg a day? He did the last time we discussed it. Paul – After a brief rash of hypo/hyperthyroid symptoms, I traced brain fog/head pain/hot flashes,/cold hands and feet/swelling feeling in neck to eating 2 packages of wakame in quick succession a week or two ago. Also potentially 1-2 capsules of kelp around the same time. (Unsure if this is accurate, but my symptoms seem to largely fit hypo/hyperthyroid – also had some night sweats, constant head pain, some weight fluctuation, and lots of joint pain.) Only other thing I can t hink of is too much Vit D supplementation 1-2 mnths ago, when I started with 5000 IU D/ 500 mg K2. I’m hoping to correct that by supplementing K2 and have stopped supplementing D3 until I can get levels tested again. If I haven’t been consuming or supplementing Iodine apart from the 2 packages of wakame and 2 kelp capsules but following the PHD, should I supplement with, say, 2-3 Brazil Nuts / wk _and_ ~225 mcg Iodine, or just the Brazil Nuts to correct potential Se deficiency from the sudden consumption of lots of Iodine? How long does Iodine stay within the body? Is it stored? Iodine is used in tissue and for thyroid hormone. It takes about 3-4 weeks for the body to reach equilibrium when iodine intake changes. Thyroid injuries often generate damaged cells/nodules which produce thyroid hormone unrestrictedly from iodine. If you have that, you will be hyperthyroid after eating a large dose of iodine, say from seaweed. I would make sure you vitamin A levels are good by eating 1/4 lb liver per week and lots of carotenoid rich plants (spinach, sweet potatoes, carrots), and avoid any large doses of iodine such as kelp (you shouldn’t eat kelp). Small amounts of wakame may be tolerable. Avoid iodine for a bit but then try adding small amounts. You can get our 225 mcg tablets which are pretty small and cut them with a razor into quarters. Try 56 mcg/day at first and if that is well tolerated for a month, then double it to half a 225 mcg tablet per day. 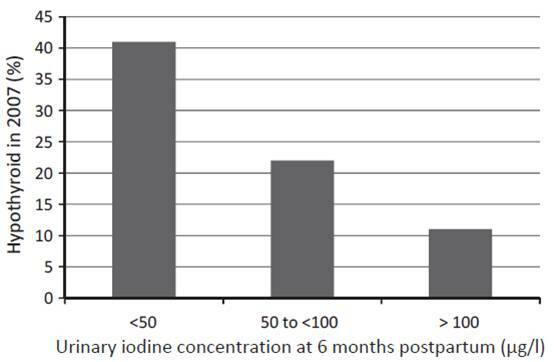 Low doses of daily supplemental iodine are protective against thyroid injury, so they’ll make future hyperthyroidism less likely, but iodine can exacerbate pre-existing hyperthyroidism. Just finished reading the article and all comments. Very interesting and well-researched. I was diagnosed with Hashimoto’s/chronic thyroiditis after a fine needle biopsy of a thyroid nodule, but all blood work is extremely “normal.” Primary care & endo dr. are not interested in treating symptoms (brain fog, fatigue, lack of interest, etc.). Would I be a candiate for iodine supplementation? Many thanks for any thoughts or suggestions. I was thinking of going on a ketogenic diet and lower carbs, but would that further reduce the conversion of my T4 to T3? I was thinking of increasing my coconut oil consumption as well. I’m also taking iodine drops. Anyone have experience with this? I was 138 December 1, I’m now 151. My weight has been the same for 20 years outside of pregnancy. I feel like I’m going to explode if I keep going at this rate. This is by far one of the best collections of science regarding thyroid I have found since my eruption of hypothyroid symptoms in the last couple of weeks. I am a female in my late 20’s, and have been explaining away numerous hypo symptoms my whole adult life. Recently, I decided I didn’t feel very healthy (decreased energy, mental fog, perception of environment, etc.) so I decided to do a 5 day juice fast. I felt more sluggish and apathetic than ever, but completed the cleanse. At the same time, I decided a kelp supplement was a good idea and took one capsule per day for a little more than a week. I have since stopped after discovering the dangers of kelp and heavy metal retension. Since the cleanse several more acute symptoms have popped up – dark circles under eyes, puffy face, extreme dry eye and mouth that disrupt daytime and sleep, tinnitus that keeps me awake at night, increased lethargy. I am waiting on a doctors’ appointment with my naturopath, but feel I am going downhill quickly. Swallowing seems to be somewhat impaired in the last day or so, which could be related to the dry mouth, or could be swelling in neck – I can’t tell. I have lost 10 pounds in the last week (not the goal), but have also given up sugar, coffee, and for a long time now have been gluten free and processed food free. Three weeks ago I rid my water of fluoride and chlorine with a Big Berkey water filter, and have been drinking a TON more water (doesn’t taste like poison anymore, yay !). I strongly suspect iodine deficiency (transdermal disappeared in less than 8 hours), and hashimoto’s, maybe sjogren’s. I have so many questions, but I will keep it simple. I want to start supplementing selenium as naturally as possible, and also T/D iodine. I am frightened that doing so may put me in a tailspin. I suspect that removing the iodine insults from my diet, temporarily adding kelp, and rapid weight loss (10 lbs in 1 week) due to juice only diet may have already begun the tailspin. Any advice would be greatly appreciated, as I want to be prepared when I meet with my doctor and this is all happening so quickly. It’s frightening. Thank you, Paul, and anyone else who has been through something similar and cares to share. Usually selenium supplementation is not necessary on PHD since it is a selenium rich diet (beef, lamb, seafood, eggs are all selenium rich), but it wouldn’t be bad to supplement for a week or two just to make sure. You don’t want an excess either though, so don’t supplement routinely, or limit it to once per week (200 mcg). Iodine — I recommend a steady low supplemental dose, like 225 mcg/day or 150 mcg/day, plus eating plenty of seafood and seaweed. The seafood provides most of the iodine but the supplements ensure that you get a steady amount every day which is beneficial for thyroid health — no big fluctuations in thyroid dose. If you take a large dose of iodine in a deficient state, that can harm the thyroid (maybe something like that happened to you). But the key to curing hypothyroidism is general good health practices and healing the gut. So you want to eat PHD and follow our lifestyle advice, especially circadian rhythm entrainment (chapter 42). And how do we test it? blood? serum? plasma? urine? hair? nails? intracellular white blood cells? These are really important questions that I have been looking for an answer for a very long time. I would appreciate your kind reply. Further, the continuous, unsustainable groundwater withdrawn from the Guanajuato region has led to the groundwater table dropping at an astounding 1 m/year. This over-exploitation of the groundwater has led to continuously higher levels of arsenic and fluoride to unhealthy drinking water levels. So we have this regime of Iodine and Selenium. But it looks like nobody really has cured their disorder using this? I think this occurs due to accumulation of heavy metals in the gland causing the attack rather then a pathogen. Where do you get 1mg tablets of iodine, Iodoral is 12.5mg. So at moment TSH is around 3.33 Abs are in the 400s and I get hair falling more and joint problems and tingling in hands and muscle twitches. Can taking Iodine really help this, as it seems there is iodine deficiency. Do people find using NDT is more reliable then iodine? Does NDT help the gland rest and help it recover? I agree, sushi rolls are toxic due to the heavy metals in them and I think this is causing the problems not the iodine in it, and once your gland has these metals your pretty screwed. I just started taking the Iodine Plus 2 supplement. 1 tablet daily with a dosage of 12.5 mg iodine/iodide 15 mcg Selenium and 15 mg Vitamin B2. Along with this, I am taking 1000 iu of D3. I do not wish to exasperate my condition or cause harm to my already low functioning thyroid. Please advise, as I have been told iodine added to your system could cause thyroid cancer. I wish to be proactive after 15 years of suffering without much positive results. I am also taking a prescription from my doctor of 0.15mg of levothyroxine (synthroid). I would appreciate your input especially regarding the intake of iodine. Thank you. I think that’s too much iodine. We recommend 225 microgram iodine per day, about 1/50 what you are taking. The other supplements are OK.
Also, work on vitamin A (liver, spinach, carrots), sunshine, circadian rhythm entrainment, and gut health. Hi Paul. I dont take supplements but after reading your take on hashimoto’s and iodine I decided to start eating more sushi, nori sheets and seafood in general. I am eating PHD for about 4 months now (but i would never touch those iodine rich foods because of what I read from other thyroid doctors). I eat plenty of salmon, sardines and eggs however. My antibodies used to be more than 1000 now they are around 450. I think after 4 months on the diet its time to experiment with the iodine issue. do you think for women who struggle with weight loss and hashi’s, taking iodine/eating iodine rich foods will most likely cause weight gain or weight loss? and have you had any sucess stories from women? From one “Hashi” to another, Plz consider selenium along with iodine. Just taking iodine but not selenium can make a Hashi sicker. Also, having one autoimmune condition increases your likelihood of developing another, so it’s important to clean up your life/food/thoughts. GreenMedInfo can connect you to awesome health summits, including thyroid and autoimmune issues and experts in health, unlike conventional western medicine/food plan which likely contributed to your developing Hashi in the first place. Thank you so much for your help. Very kind of you to answer. I have had swings between hypo and hyper which led me to be constant hypoglycemic. Although I didn’t had a diagnosis for that (only for Hashi’s 6 years ago). After eating PHD for a couple of months I am no longer hypoglycemic.. but I am still afraid of Hashitoxicosis and/or developing another auto immune disease. I have raynaud’s in the winter also so my immune system is wrecked. My antibodies are much lower eating PHD but as far as I know I can only be “at peace” if they’re down to less than 20. I don’t know what is the probability of developing more autoimmune diseases though, but that scares me. I am only 21 years old. Great, great, GREAT article Paul! I am a specialist at a clinic in Tampa, FL that specializes in Thyroid disorders such as Hashimoto’s disease and you would not believe how many doctors are misguided on this subject. Please continue to post and keep the public informed about important issues such as this. I am a young adult male currently being treated for hypothyroidism with possible Hashimoto’s. Lat October my TPO antibodies were <10 and TgAb was <20. Dr. still thinks I may have Hashi's though because my mother does. I have my follow up bloodwork coming up very soon. Currently I haven't been supplmenting any iodine but have been consistently taking 200mcg of Selenium per day. I eat a whole foods paleo type diet so I'm now concerned I might have too much Selenium. * Should I reduce my Selenium? If so, to 100mcg? * It looks like I should add iodine. I have a bottle of Lugol's. Would one drop be too much? * My upcoming bloodwork includes TPO/TgAb tests and T3, T4, etc. Should I introduce some iodine beforehand while keeping my selenium the same (200mcg), eliminate selenium and not add iodine, or not add iodine and keep or reduce my selenium? Getting the right labs has been hard to come by so I want to make the best use of them. I was hoping you would elaborate on your personal decision to stop taking mg doses of Iodine. I am in the process of seriously considering Dr. Brownsteins protocol for Hashimotos. You mentioned above that you experienced selenium toxicity, but why did you choose to stop the mg doses of iodine. Many of the people i have spoken too claim that the iodine protocol was the only thing that worked for them, and eliminated their antibodies. As you know there is always contradictory information when it comes to treating Thyroid disorders, but i am interested to know more about your experience. We’ve had plenty of Hashimoto’s cures on PHD without high doses of iodine. I stopped the high doses of iodine when I developed a thyroid injury, concurrent with overdosing on selenium. Once I realized how easy it is to overdose on selenium I became convinced the risk exceeds the potential reward from high dose iodine. 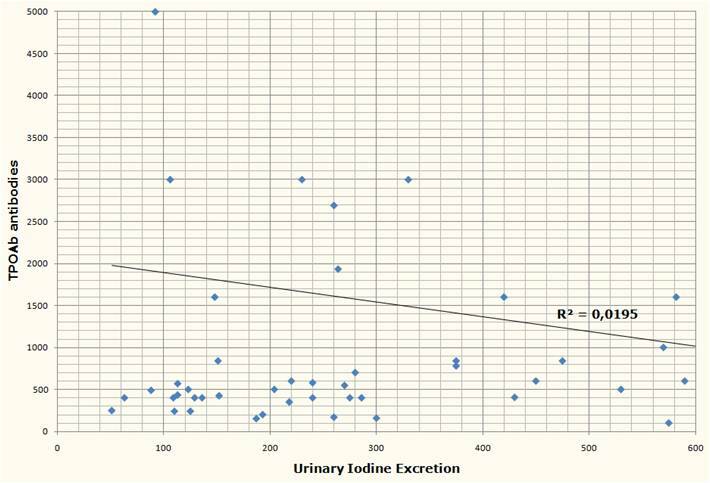 A few readers have developed problems on high dose iodine as well. I just finished Brownstein book and his iodine doses recommended are way higher then yours. I wonder and seriously I cannot understand why if iodine can help so much according to Brownstein why most of the functional medicine world is against it when it comes to hashimotos? Would not this be as simple as test your iodine , if deficient supplement and don’t worry about tsh and wait for the miracle cure after some time? Is browstein crazy or maybe he knows more about iodine the others? I have headed in one of his interviews that he healed his children from hashimotos with the use of the iodine. I don’t thing that he would be that stupid to harm his own kids. I just don’t get it what is going on with the iodine? I am wondering about your comment on Tregs. I think I read man y years back that Prilosec had this curious side effect of increasing Tregs when taken on an empty stomach-so as to not unduly lower stomach acid. So could Prilosec have a positive effect on the Tregs involving the thyroid? Dr. Jaminet, what was your selenium status before supplementing selenium? There’s so much discussion of supplementing iodine and selenium when selenium is low — but what about those of us who appear to have adequate selenium intake?? I have Hashimoto’s that’s subclinical hypothyroidism on the brink of needing thyroid hormone. Without supplementation, my blood selenium level is 245.00 ug/L, range 100-340. I tried eating one Brazil nut a day for a few weeks and my selenium went significantly out of range! It took several months with no Brazil nuts to go back to where it is now. It seems I get plenty of selenium from the fresh, local veggies I eat (N. California farmland has lots of selenium). Can I just start adding iodine?? Yes, don’t supplement selenium and do take a low dose of iodine (225 mcg/day is what we recommend). Excess selenium is dangerous and that’s why we don’t recommend routine supplementation. Clarity, finally! Thank you, Paul. 1.5 years ago I started a low carb diet and cholesterol increased till now (433 TC). TSH increased too form 2.06 to 5.83. Now T4 is normal but T3 is in the minimun of the range, and low TPO . I have started increasing my carbs. I don`t know if the TC have been increased because of my probably familiar hypercholesterolemia (only mother) or hypotiroidism and I will try suplemnt with iodine and sellenium for avoid taking statins again. What dosis of iodine and sellenium do you advise me to start and to continue? How much time or till wich level of TSH? Hi Triki, TC of 220-240 mg/dl is normal. So getting back to the low end of your historical range would be perfect. The high cholesterol does indicate you were too low carb. The hypothyroidism is also elevating LDL. You should be getting the hypothyroidism treated with levothyroxine, also supplement iodine 225 mcg/day. Check your iron levels, aim for ferritin of 50-130, if it is higher than 130, donate blood. Selenium you may not need but 200 mcg/week is fine. Take a levothyroxine dose that gets TSH to 2.0 or so. Thank you very much, Paul. My ferritin levels were a bit high 15 years ago (120-200) but last 4 years, before taking statins and low carb diet they rounded 300 and with statins and low carb became 419. Last, with low carb but no statins 276 but I can’t donate blood. My doctor is against suplementary hormones so he will say me not to levothyroxine, but if it could be enough with iodine he would agree. Hi Paul, I started supplementing with iThroid iodine 12.5mg for 12 weeks with a normal TSH of 2.4 and was asymptomatic at the time. After 12 weeks on iThroid, my TSH shot up to 14 and my FrT4 was low(.49). I was tested positive for TPOab(201) and negative for Thyroglobulin Abs. I was asymptomatic at the time, but got scared and discontinued iodine. Five weeks later, I started having issues with brain fog, headaches and fatigue which have increased in intensity. I was tested seven weeks after discontinuing iodine and all my thyroid levels (TSH, FrT3, Reverse T3 and THab) were normal with the exception of TPOab which was 161. I started a gluten free diet five days ago without any symptom improvement. 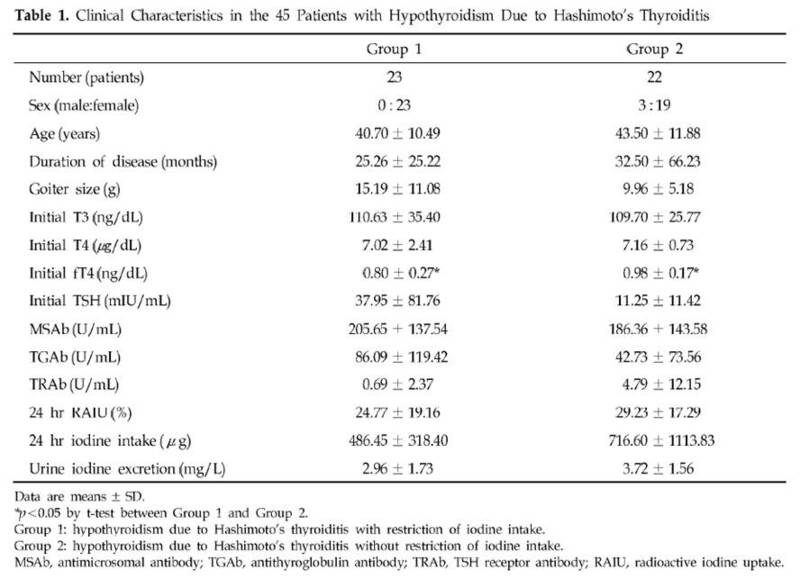 Is it possible to have Hashimoto’s without the presence of Thyroglosbulin antibodies? I think I may have triggered this Hashimoto’s by taking iodine with a selenium deficiency. I am getting a blood serum test for selenium and I am planning on getting an iodine test through ZRT Laboratories before I start any iodine/selenium supplementation to address the TPOab as well as my symptoms. I was planning to supplement with 200 mcg/day of Salenium and a low dose of iodine (225 mcg/day) and build up slowly with the iodine. Where do I get a 225 mcg dose? I hear Kelp tablets are bad and can contain toxins such as mercury and bromide. Not sure if you are aware, but this is an old 2011 post. Paul’s recommendations for Iodine and Selenium have changed (considerably). These updates are in the latest book (i think). You can also read a number of comments on the topic by Paul in the comments above (search for Paul Jaminet to find all his comments). I have been doing research on iodine and selenium and there is mixed evidence on its effectiveness. I have not found any case studies where people were completely healed of their autoimmune condition with iodine/ selenium or with any supplement for that matter. In my opinion, diet (going grain free) is the best way to heal and seal the gut and heal the immune system. I would urge everyone to look into the GAPs diet. It has done wonders for my son’s allergies and asthma.